Congrats Cousins Lolla & Lilly Tenwalde! Wow! Check out these amazing wooden speedsters built by cousins Lolla and Lilly Tenwalde. 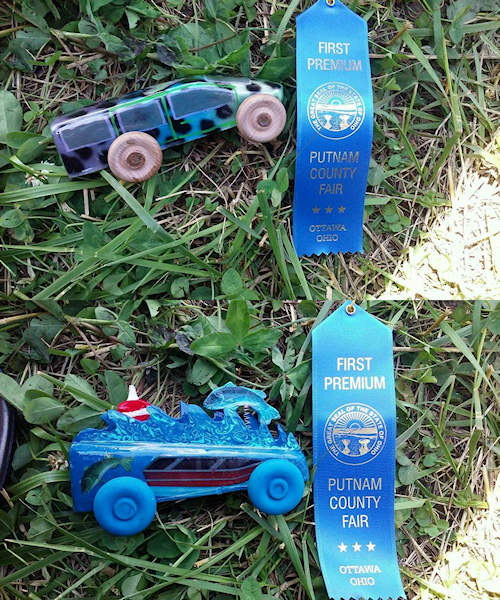 Lolla and Lilly were on the news because at the Putnam County (Ohio) Fair this week, Lolla’s car (pictured at top) won the Pinewood Derby for fastest car, while her sister Lilly’s car (pictured underneath) won the Pinewood Derby for best designed car. Lolla and Lilly Tenwalde are the daughters of Elizabeth Tenwalde, granddaughters of Jerry Johnson, great granddaughters of Rosabelle Johnson, 2xgreat granddaughters of Charles Schmidt, 3xgreat granddaughters of Karl Schmidt, 4xgreat granddaughters of Dietrich Schmidt Jr., 5xgreat granddaughters of Dietrich Schmidt Sr., 6xgreat granddaughters of Johann Friedrich Schmidt, 7xgreat granddaughters of Johannes Schmidt Jr., 8xgreat granddaughters of Johannes Schmidt Sr., and 9xgreat granddaughters of Hans Heinrich Schmidt.